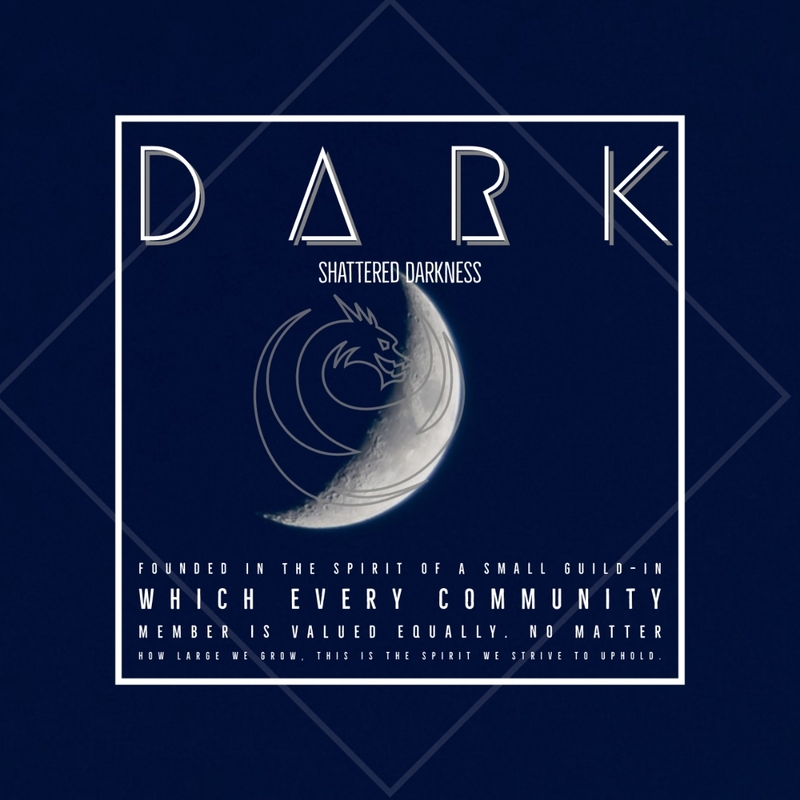 Shattered Darkness [DARK] [NA] [PvX] - No iron-fisted, heavy-handed management here. Our friendly, helpful, laid-back and active community is recruiting players of all skill and experience levels with an interest in sharing and learning every aspect of the game to join our ranks. We believe that a community is only as strong as YOU make it and expect our members to be the core of our community and our guild’s very best assets. We require only that our members should contribute and give to our community what they expect to get out of our community. If you are interested in joining us or have any questions, please see our in-game contacts below or, comment here with your account/character name, your primary focus in-game and what you are seeking in a guild and we will do our best to get back to you as soon as we can! See above for contact info! Shoot us a message with any questions you may have! Hiya - I'm a total noob to the extent that it's embarrassing. Aimee Zeeva in game, still really low level, only been playing about a week now, but it's a slow and lonely grind and I'm completely lost >.< I'm looking for a CASUAL guild with a diverse, interesting group that has appreciation for CASUAL ignorant boot players like me, with the hopes to have some company and perhaps be able to glean some knowledge, and maybe some day pass it on. All I have found so far are guilds that require x number of guild events per WEEK (le sigh) to not get booted. Not the category I'm looking for. You guys have requirements like that? Hey, @Aimee.5721 . We have very few requirements of our members outside of the common sense, "don't be a kitten" sort of thing. We do ask our members to put into the guild/make the guild whatever it is they want it to be since every player has different expectations. I am brand new to GW2 and interested in joining a guild. I'm learning game still but have no idea as to how to join this guild. Any help is appreciated. @Javalita.4836 I will send you an invite in-game. I will also send you a message so that you can message me if you need any assistance with accepting the invite. It may be easier for you to join us on Discord and I can walk you through everything you'll need to know. Please use Javalita as your name when you join Discord so that we can have our people ready to help you out! Thanks! @Sookie.6580 Absolutely! I'm new to the game and have no problem pulling my weight to contribute where I can. I originally joined a EU region - should I transfer to a NA to get invite? Semi-experienced in all game modes (though I don't really raid) and looking for some chill peeps to run fractals/wvw/whatever with sometimes. I'm on DH, I've seen your tags on that server before, I think. I have a small group that I usually run with.. but they are branching out to other cliques so I figure I might as well branch out too. @Rogerthatroger.6409 ahhh! We would love to have you! I'll throw you an invite shortly (sorry it's so late)! We'll see you ingame! @Aimee.5721 are you European? Not that it matters, we would welcome you, regardless but I wouldn't want you to regret the move if you are and most certainly want you to find the guild that is best for you. Easier said than done but timezones do make a difference. If you still want to, you are able to join an NA guild however, you wouldn't be able to play with anyone in the guild. If you're joining for active, social chat? You're free to stay where you are. If you want to interact in-game with your guildies, you would want to move to NA. That, unfortunately, means deleting your characters and starting fresh. If you have any questions, or still want to join, let me know. We would love to have you, just don't want to make you jump through hoops to join us. @Sookie.6580 When I started a couple weeks back, I thought we were moving to Germany, but apparently chances are we're just moving west (the roller coaster joys of military life). I did a little looking and I have a free region transfer available, just want to make sure I choose the right server to transfer to so I don't waste it. @Aimee.5721 I believe that might be a server transfer over, transferring from EU to NA but let's do this! I'll shoot you an invite and get you an invite for Discord (might be easier to communicate if we're able to post links and screenshots) and maybe one of my senior officers can walk you through transferring (he has done the transfer several times on alt accounts. We're excited to have you! is not required) it is hugely beneficial to join since it is active mostly 24/7 and has a ton of resources and on demand help for our new players. I'll get you an invite in-game as soon as I can! Welcome to the guild! Hi, in game name is "Grimorsk". I have been doing my own stuff but recently have gotten really in to the game and wanted to learn fractals and raids... I mainly want to become a better Scourge as I have just started trying it out and am working on my first set of ascended gear. Also, I have a commander tag so if I could learn how to lead meta events in PvE I would very much like that. I do tequatl and some other things here and there already. Want to be a good commander and a killer at fractals or raids. Throw me an ingame message if you have any questions! Still recruiting! PM me ingame or comment below if you have any questions! Currently organizing for fractal training and advanced fractals. Join us! Shattered Darkness is recruiting members of all skill and experience levels! Comment or shoot me a message via in-game mail! Hi I was wondering if it was alright if I joined? I've been playing alone so far and I've been looking for a guild to join to help make the game more enjoyable along with meeting new online friends. My in-game name is "Mogli Moon"
@Aurorament.8523 we would love to have you! I will shoot you an invite (and message) in-game in a bit! We'll chat then! I do casual play, have all the expansions active. @Scathaigh.7065 We would be happy to have you. We actually have an officer wanting to recruit some more people from GoM so, he'll be extremely pleased that you found us. I will send you an invite in a few minutes! Welcome to the guild! Hi! Are you still recruiting? I love most all aspects of the game and casual socializing. I've been playing for a long time and I'm just looking for a group of nice people to hangout with sometimes. My in game character usually is Ameirynn. I'm on Darkhaven. I'm interested in joining if you're still recruiting. I'm new to the game but picking it up fast. I've played EQ, Rift, and WoW extensively. @Sockski.4297 @Zlot.2319 I'm so sorry For the delay in responding. I will message you both ingame tonight and send out invites! We would love to have you both! @aznbabiegrlB.2941 I'll get you an invite shortly! I've been playing Guild Wars 2 for a long time now, however for the last year or so I have been playing alone due to the guild that I originally transferred from GW1 to GW2 with, no longer exists, and I never found a new one to join. I would like to do high level fractals and would also like to learn how to raid if you guys do that kind of stuff? I have a good bit of experience in PvP and also in the dungeons. I also have a pretty good knowledge of crafting, ascended creation, etc... though I'm sure most players know those things as well! I'm not sure if I fit the bill or not, but I would like to join or at least meet everyone! @Cara Khati.9685 we are actually just starting up our t3/t4 fractal training group so, you're welcome to join us for those. As for raids, we currently have a static group that occasionally recruits from within or has sub spots. But what we can definitely do is direct you to some resources for raid training and help you through it also. I'm going to shoot you an invite and you can come check things out. We are currently in the process of a reorg so, you'll have to excuse the mess . I'll send you an ingame mail as well! We'll see you on and hopefully, welcome to your guild!